At last! 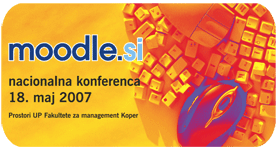 I am happy and proud to announce that the first Moodle Moot in Slovenia will be held on May 18th 2007 in Koper, Slovenia. Moodle Moots are conferences for Moodle users that Moodle lovers organize all around the world (more info can be found here). Since we opened Moodle.si (an online community for Moodle users in Slovenia) it’s also been our wish to organize a live event where Moodle users can meet in person and exchange tips and tricks ;-) Now, after a few months of planning, meetings and ideas of all sorts we are finally a step closer to making our wish come true.